are installing the shell mosaic. Or why their shell mosaic are becoming dull after installing. In fact,they miss some simple but important details. For making it much easier,we make one installing processing photo for reference,pls check each step as the follow photo. 1.We suggest choosing the special agglomerant and building sealant(We suggest to use tiny granule glue or white grout). with the sponge trowel. Note: Please use the sponge trowel, others will damage the mosaic surface. another word,all the shell mosaic's surface shiny will be gone. 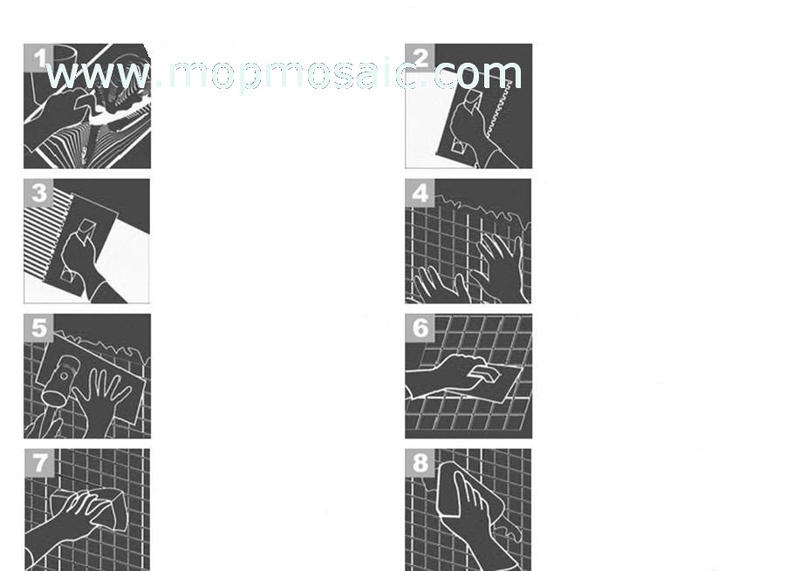 8.Then use the dry and clean towel to clean the mosaic surface is ok.
be very shiny after installing. 1.Do not irradiate the surface with 100W above light. 3.Would better use tham soft cloth clean the surface,and wax them regular time for keeping the shiny. your project photo to us for reference...:) ! Here having some words link,you may interested in. Just click the skewed words is ok.